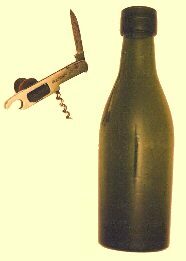 In the summer of 1996, I had the good fortune of acquiring this knife with corkscrew, cap lifter and stopper extractor. The blade is marked WILHELM MEYER SOLINGEN. The obverse of the handle is marked GEROLSTEINER SPRUDEL and the reverse NUR ECHT MIT DEM STERN, D.R.G.M. (with lion in sunburst logo). It is a German patent and evidentally the patent is for the rectangular cutout used as the stopper remover. The bottle shown has an internal thread at the top which matches the thread on the stopper. The stopper is marked H.G......Don Bull.